Breeze have always respected our customers’ privacy and that of guests captured with our software. Our software is sold worldwide; our customers have differing ethical and legal responsibilities about processing and handling data (including photos and other images). 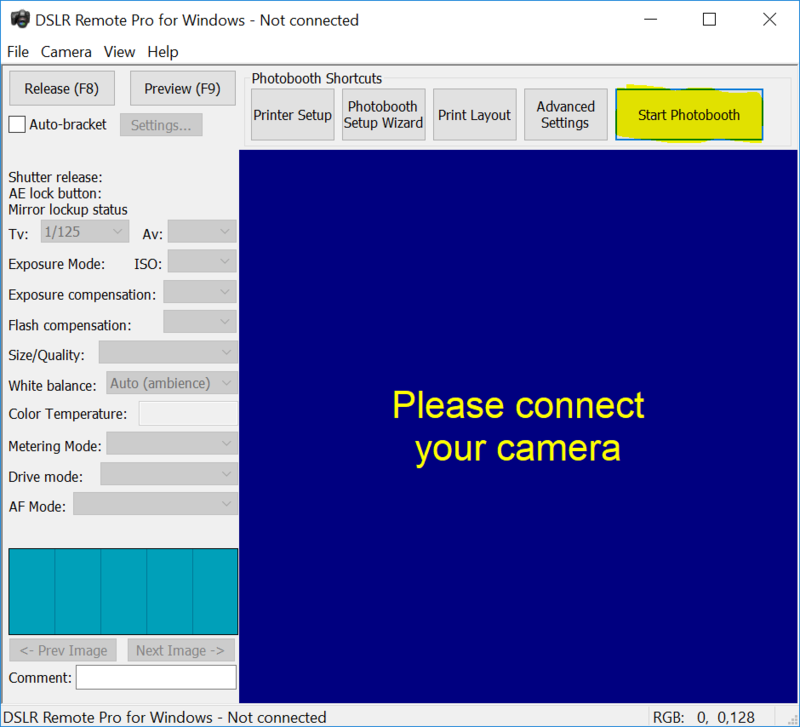 No Breeze photo booth program (ie DSLR Remote Pro, Webcam Photobooth, DSLR Remote Pro for Mac, and PSRemote) shares photos online by default; photos are only shared if the program is explicitly set up to do so. Breeze Kiosk was developed to enable social sharing. The current release Breeze Kiosk 1.4.4 will only transfer images to/from any social media site if the program is explicitly set up to do so. Note: Older releases of Breeze Kiosk defaulted to allow images to be uploaded to Facebook. Images are only uploaded to other social media sites or downloaded from Instagram and Twitter if the program is explicitly set up to do so. Breeze Kiosk privacy mode will only allow images to be displayed, shared or printed if the user enters the correct code. When images are shared by MMS and ‘SMS + Image’ using Twilio, the shared images and file names are stored on Breeze servers for 7 days and then deleted. The mobile number is not stored on Breeze servers. It is possible (although not necessary) for a user to generate image file names which include personal information about the event or guests. The Breeze servers are hosted by an EU based ISP. The current versions of our photo booth software and Breeze Kiosk allow you to offer ‘opt in’ consent to image sharing. Where oursoftware enables users to upload, download, and store photos the user controls where and how the images are sent; often using third party services such as Facebook, Twitter, and Dropbox. Don’t forget that it is your responsibility as user to ensure the third-party services you use are appropriate for your events and the jurisdiction you are working in. Usually photo booth images are shot in ‘landscape’ mode; so that you can comfortably include several people in the shot. Sometimes we want to vary this. This post explains how to create and print square photos using DSLR Remote Pro 3.7.3. Webcam Photobooth, NKRemote and PSRemote work in a very similar way. First we need to change the shape of the live view image; then change the print layout to match. 1. Start DSLR Remote Pro and run the Photobooth Setup Wizard to set up a basic booth, selecting a single photo at Step 1. 3. 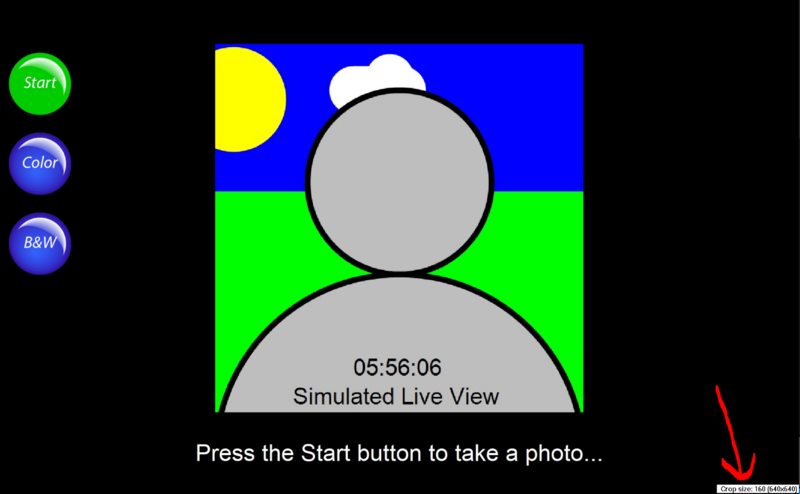 Crop the live view guests see by holding down the ‘shift’ key and pressing the cursor right arrow -> until the live view window is square. The amount of cropping is shown in the lower right corner of the screen. If you overshoot press ‘shift’ and the left arrow <- to reduce the cropping. 4. Check the crop size to see whether the live view window is square: numbers in brackets show (width x height) of the live view. 5. 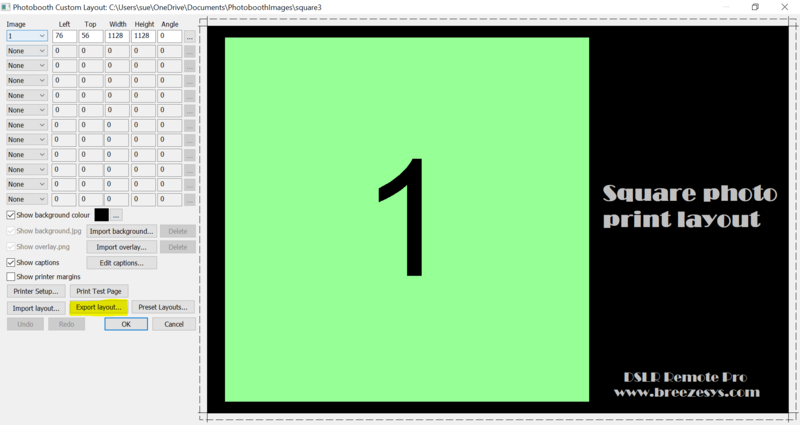 Press <Escape> to exit Photobooth mode and select the large ‘Print Layout’ button to open the Print Layout Editor. 6. Right click on the photo in the print layout and select ‘Edit image position’. Set the image width and height to the same value to make the photo square. 7. Click OK, drag the photo to the required position and/or resize it by dragging the corners. 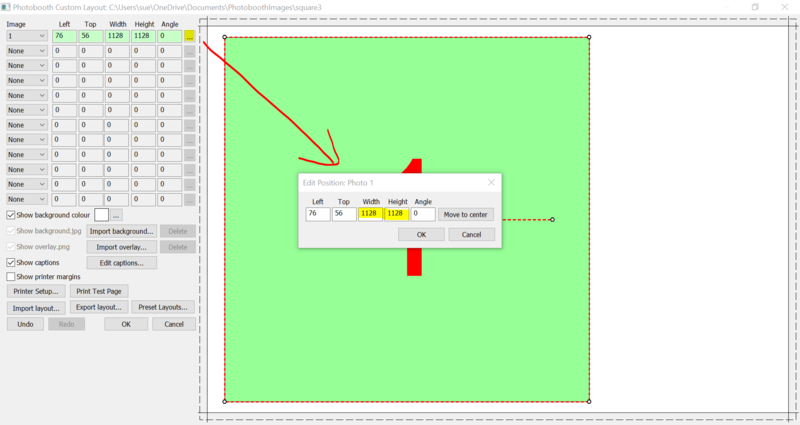 Add any captions, background etc before exporting the layout to save your work. Square photos can be combined with filters to give a pop art effect, or used singly for a ‘polaroid’ look. This method can be used to create rectangular photos of any proportions you choose. More details. Ready for more? You can also create round (or any other shape) photos using a live view overlay and print overlay. You will need to create these overlays in an image editor such as Photoshop. The DSLR Remote Pro help files explain how to customize screens and prints in more detail.